Know your gas consumption and compare it to any 2009 car here. A free link to the original Science article can be found here and a post summarizing the original Science studies can be found here. A GPM calculator can be found here. It allows you to calculate gas consumption (and costs) for your current car and for all 2009 cars. This is a model of what the EPA and Consumer Reports should offer to fix the illusions caused by MPG. Offering a gas consumption measure (GPM) in addition to MPG is a low cost way to give consumers better information - as proposed by Representative James Sensenbrenner. It should be a bipartisan no-brainer. As we describe below, both gas savings and CO2 reductions are a linear function of decreases in GPM; neither is a linear function of increases in MPG. A more detailed post summarizing the basic argument for GPM can be found here. The end of this longer post explains why "going metric" doesn't solve the MPG illusion and why "percentage improvement" also leads to misperceptions. The math is trivial. GPM is the inverse of MPG, and the relationship is curvilinear. What is not trivial is that car buyers assume that they can take a difference in MPG when comparing cars to gauge gas savings. GPM, but not MPG, operates by subtraction. The math to compare fuel economy across cars is not trivial. It involves more than taking the simple inverse of GPM = 1/MPG. Specifically, the math requires taking some distance, X, and dividing it by two MPG figures before taking a difference: X/MPGhigh - X/MPGlow. For example, the improvements from 10 to 11 MPG, 16.5 to 20 MPG, and 33 to 50 MPG all save the same amount of gas over a given distance (e.g., 100 gallons per 10,000 miles). To measure gas savings, MPG requires division before subtraction (e.g., 10000/20 - 10000/16.5). However, people intuitively rely on subtraction when comparing MPG, which creates illusions. GPM, not MPG, allows car buyers to use subtraction to compare the fuel economy of different cars (e.g., 600 vs. 500 gallons per 10,000 miles). GPM makes the magnitude of gas savings clear without additional math. Europe, Canada, and Australia use volume over distance (liters per 100 kilometers); India and Japan, like the US, use distance over volume (kilometers over liters). Kilometers per liter creates the same illusions as MPG. MPG answers the first question. It is useful when judging the range of one's gas tank (can I make it two more exits before a refill?). But it answers a less important question. GPM answers the question of gas consumption. We suspect that, when buying a car, most people want to know gas consumption. Gas consumption, as measured by GPM, can be directly translated to the cost of driving the car and to the amount of greenhouse gas emissions (100 gallons of gasoline = 1 ton of CO2). MPG cannot. Differences in GPM provide a direct measure of gas savings and CO2 reductions. Differences in MPG do not. I am writing to ask you to consider adding gas consumption information to the fuel efficiency information currently provided on automobiles sold in the United States. Currently, as required by law, the EPA provides information on “miles per gallon” (MPG). 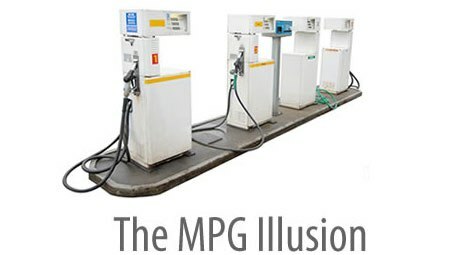 However, in research published in June, 2008 in Science (Larrick and Soll, "The MPG Illusion," Science, 320 (5883) p. 1593-1594), my co-author and I showed that MPG misleads car buyers when they compare the gas savings available from different cars. Because GPM is the inverse of MPG, gas savings declines rapidly as MPG increases. Thus, the largest gas savings come from removing the most inefficient vehicles. Replacing a car that gets 14 MPG with a car that gets 25 MPG reduces gas consumption (and carbon dioxide emissions) more than any possible replacement of a 33 MPG car over the same distance. MPG obscures these savings. The research in the Science article showed that people tend to subtract MPG when they assess the gas savings of different vehicles. This “linear” thinking creates illusions, leading people to undervalue replacing inefficient cars. Only a measure of GPM can be subtracted. What can the EPA and the Energy Department do to help consumers? The remainder of this letter suggests possible improvements to the fueleconomy.gov website and the annual Fuel Economy Guide (http://www.fueleconomy.gov/feg/FEG2009.pdf) which are jointly run by the EPA and the Office of Energy Efficiency and Renewable Energy (EERE) of the Department of Energy. The current fueleconomy.gov website provides some of this information, but only to a limited extent. There is an option of switching to gallons per 100 miles—although no explanation is given for why consumers would want to focus on gallons per 100 miles. Because the fueleconomy.gov site never mentions the need to compare gas consumption, few consumers are likely to elect the option. The fueleconomy.gov website automatically displays fuel consumption per 25 miles for each vehicle. However, the distance is so small that it makes all cars appear very similar in terms of gas consumption. Using a larger base—at least 100 miles, or better, 1,000 miles or 10,000 miles—makes differences in gas consumption between cars clear. The site also automatically displays a number of annual measures that are linear proxies of gas consumption: Barrels of oil consumed, carbon footprint, and gas costs. These proxies are very useful. However, none of these are effective as a standard, memorable unit of efficiency (i.e., they are not comparable to MPG in terms of how well they "stick"): Barrels and carbon footprint are unfamiliar. Gas costs fluctuate with gas prices so memorizing listed gas costs in the year of purchase (if possible) is uninformative for later car purchase decisions. In contrast to the proxies, gas consumption is intuitive. Like MPG, a standard measure of gas consumption can be remembered and compared across cars and over time. In sum, you will be helping consumers to make wiser decisions about gas consumption, and carbon dioxide emissions, by providing them with salient information on gas consumption. Please emphasize and make easily available information on gas consumption.